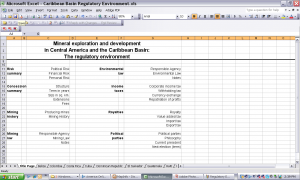 Regulations « Recursos del Caribe, S.A.
Recursos del Caribe, S.A. offers a spreadsheet summary that addresses the topics listed below for each of the twelve Caribbean Basin countries. Purchase of the spreadsheet summary includes a copy (in pdf format) of of relevant foreign investment laws, mining laws, environmental laws, and regulations. For information on the Regulatory Framework, click on How to Order. Pricing Information is provided on the page called How to Order.